I've been really getting into the science behind skincare recently and Caroline Hirons' blog BeautyMouth is a fountain of knowledge on the subject, and using her blog I've come up with a wishlist of gorgeous skincare for my blemish prone skin. I'd use my favourite cleanser the DHC Deep Cleansing Oil as it gets rid of grime without stripping my skin and leaves it nourished. Blemish prone skin should always stay away from foaming cleansers as this strips back the natural oils. This is something I wish I had learned sooner as my skin instantly looked and felt better with the change. Acid - I really want to get my mitts on the Pixi Glow Tonic, but this is so hard to come by considering I don't live in London. I think the Clarins Gentle Exfoliating Toner is a great daytime alternative. I've always heard great things about the Clarins skincare ranges. Acid is great for acne prone skin as it unblocks pores and gets rid of dead skin cells. 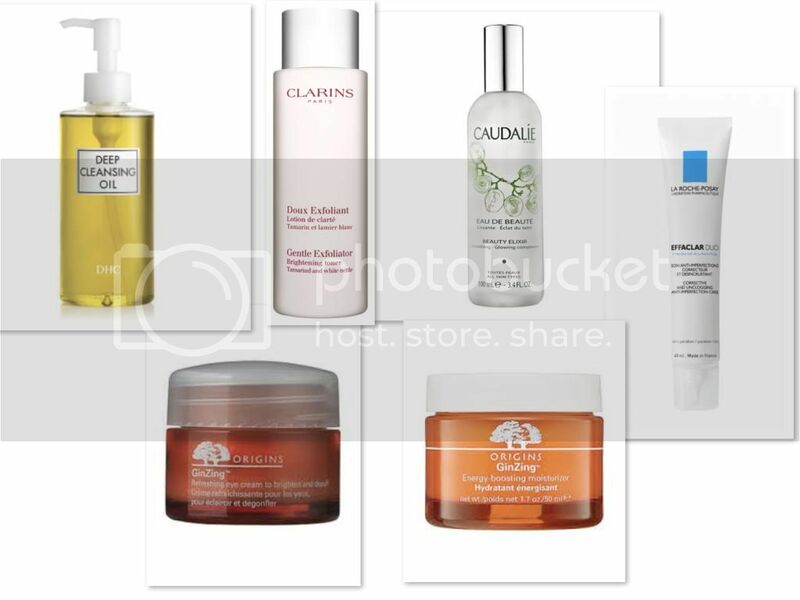 Hydration - Caudalie Beauty Elixir and the harder-to-come-by La-Roche Posay Serozinc wake up and hydrate the skin. I'm going to stick to a tried and tested one here and say the GinZing Eye Cream from Origins. It has a pearlescent light reflecting property which disguises under eye bags like no other. At this point I'll throw on my all-time-favourite skincare saviour that is the La-Roche Posay Effaclar Duo to combat my blemishes. Another Origins product here, the GinZing Moisturiser aims to brighten the complexion and as it is not too heavy, it won't interfere with makeup application. Do you have any steps you like to include in your morning routine? Check back on Tuesday for my wishlist for the perfect evening routine. I think it's kinda dangerous (and expensive!) to start thinking about what actually goes into our skincare products and what effect they may be having on our skin's health and appearance. After reading a little bit about the Caroline Hirons Skincare philosophy, I ended up making a big order from Organic Surge! I'm now very curious and a little concerned about the effects of SLS's and mineral oil, both of which are staple ingredients in so many beauty products.